As we denounced in Bulletin No. 1, today federal, state and municipal forces attacked the indigenous community of Santa María Ostula, Municipality of Aquila Michoacán in a joint operation that the “Michoacán Coordination Group” deployed. Two minors and one adult man were murdered as a result of the attacks and several comuneros are gravely injured. Also, members of the Army arrested the comunero Refugio Serrano. As of this time his whereabouts are unknown. Parallel to the arrest of Cemeí  Verdía Zepeda (First Commander of the Santa María Ostula Community Police and the General Coordinator of the Autodefensas of Aquila, Coahuayana and Chinicuila municipalities) members of the Michoacán Coordination Group attempted to detain the Treasurer of the Communal Wealth Commission of Santa María Ostula. In said action, for the purpose of passing through the comuneros and provoking the community into a confrontation with the Army, they stole radios for communication that the community uses to guard its communal territory. The Vigilance Council’s seal was also stolen. After Cemeí Verdía Zepeda’s arrest, the community established different checkpoints in each Encargatura  for the purpose of avoiding the arrest of more community members. 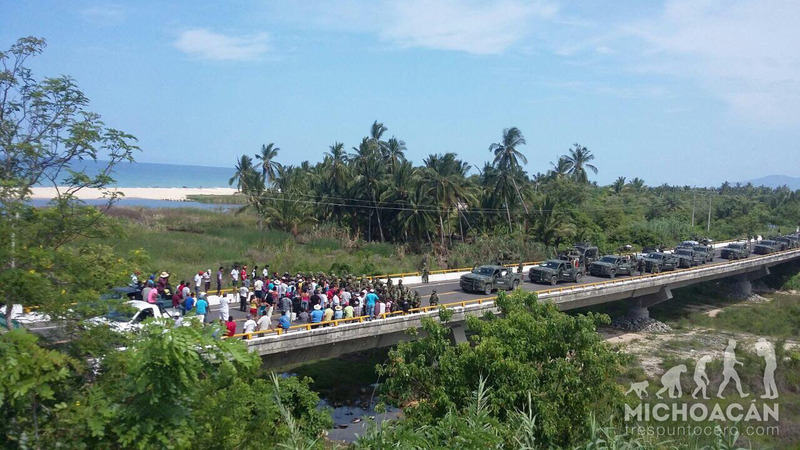 Nevertheless, at approximately 5:00 PM, federal and state forces attacked the checkpoints that members of the community placed in the Encargaturas of Xayacalan and El Duin which are located on Highway 200, from Lázaro Cárdenas to Manzanillo. At these points the federal forces used their vehicles to impact the Community Police checkpoints and they burned several pickup trucks and trailers that were there. They also used tear gas to attack the comuneros. Next, the federal forces shot indiscriminately at members of the community that were in the Encargatura of Ixtapilla, also located on Highway 200, from Lázaro Cárdenas to Manzanillo. As a result, the 12-year old boy Herilberto Reyes García, the 6-year old girl Neymi Natali Pineda Reyes and Melesio Cristiano, 60, were murdered. Horacio Valladares, 32, and Antonio Alejo Ramos, 17, were injured. Added to the above, inside of this operation the municipal capital of Aquila was surrounded by members of the federal forces impeding the exit of Aquila’s self-defense group, which is in solidarity with the Community of Santa María Ostula against attacks of which it is the object. The foregoing deals with a violation of the agreements that had been signed between the community and the government, federal as well as state, wherein it is established the commitment to respect the Community Police of the indigenous community of Santa María Ostula. It’s appropriate to add that none of the local organized crime bosses, belonging to the Caballeros Templarios (Knights Templar) “Cartel” that operates in the region have been arrested. At this time the community experiences a climate of extreme tension. While Cemeí Verdía is detained, the community has named the comunero Germán Ramírez as First Commander of the Santa María Ostula Community Police and has asked for guaranties for his life, as well as for the rest of the community, after the attacks that federal and state forces have perpetrated against the community. Once again, we call on you to be attentive and alert to the grave situation that the community of Ostula and the Costa-Sierra region are experiencing. This compañero’s name is also spelled as Semeí in the media. An Encargatura would be a governmental subdivision within the municipality (county) of Santa Maria Ostula; in other words, a small village within the county. And please read the article we posted below this one by Gilberto López y Rivas on the reasons that the Mexican government represses the autonomous municipalities.